So after we posted about Koodo slashing iPhone X by $200 on contract, it appears the sale is across the board from the ‘Big 3’ and their flanker brands (for the most part). Normally, the iPhone X starts at $600 up front on contract, but prices are showing as $200 off at $400. Telus is advertising iPhone X 64GB for $400 on a 2-year term, with a minimum $105 per month plan which includes 1GB of data. 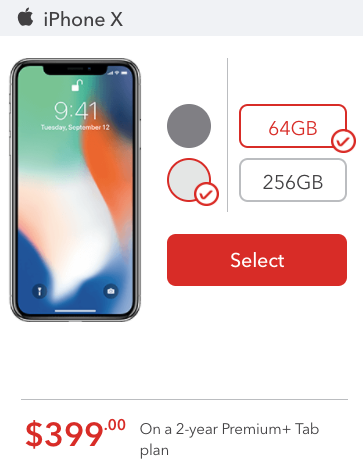 Rogers is advertising the 64GB iPhone X for $399 with a minimum $105 per month plan and 1GB of data and local calling. As for Fido, they have iPhone X for $399 on contract with a $110 per month plan which includes 5GB data and unlimited Canada-wide minutes. 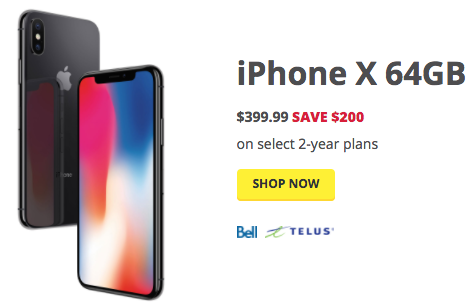 Bell and Virgin Mobile’s websites are not showing a discounted iPhone X on contract yet, but Best Buy is advertising iPhone X for $399.99 on Bell, with select 2-year plans. Again, we’re about halfway into the iPhone X life cycle, so it’s no surprise we’re seeing discounts on contract, as they will aim to boost sales during this typical lull period for iPhone, as people hold off for new models expected in the fall. If you were about to sign an iPhone X two-year term anyways, this discount maybe be in your benefit. But for those able to buy a device outright and go with a BYOD plan, that’s where you can get a ‘deal’ usually, as your free agent status means jumping to the best offer available when it pops up.